Meatballs and marinara is a universally beloved dish on restaurant menus. But there’s no reason these star ingredients need to be confined to a bowl of pasta. 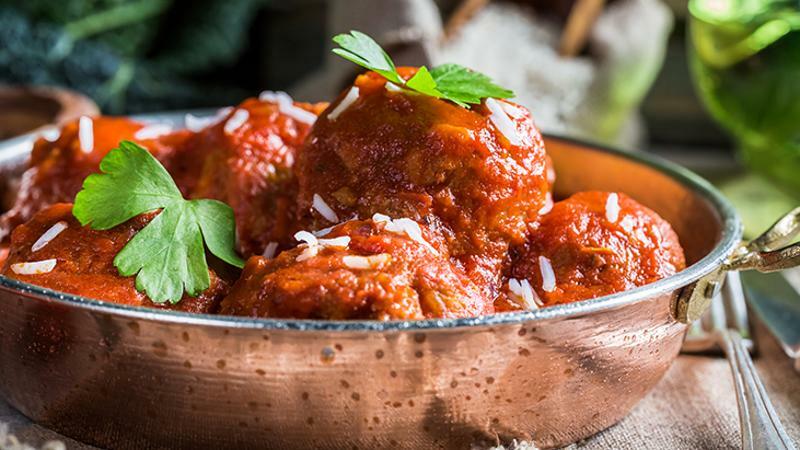 Over the last two years, meatball menu callouts have jumped close to 59%, and marinara is up on menus nearly 6% over the past five years, according to Technomic. What’s more, menu mentions of marinara as an add-on soared 143% during that same time period, Technomic data shows. Meatballs are well-represented on menus of all restaurant types and they’re increasingly being menued in innovative ways, such as on sandwiches or as toppings for pizza, polenta or mac and cheese. Operators also are offering meatballs with surprising proteins like lamb, pork and more, such as the Bison Meatballs at Tony Roma’s new flagship unit in Orlando, Fla.
Expect to see even more meatballs trending as they appear in street food-inspired bar fare on elevated late-night and happy-hour menus. When it comes to appetizers, marinara’s the top sauce. Take the Steak Firecracker Rolls at Babbo Italian Eatery, stuffed with jalapenos, onions and cheese and served with spicy marinara. Or the Crab Cakes from Broadway’s Best Pizza, also offered with red sauce on the side. And there’s no denying the red sauce’s appeal for dipping. The on-trend piadina sandwiches from Olive Garden and BJ’s Restaurant & Brewhouse both come with sides of marinara. Marinara’s growth as a sandwich topping is tied closely to the rise of meatballs on sandwiches, flatbreads and pizzas. Other operators are riffing on classic red sauce by adding Cajun flavors, Sriracha spices or unexpected herbs.